Jacob Gleason of Groovincible performing with Bellygunner at the Sammies! This photo was featured on Capitol Public Radio‘s website. 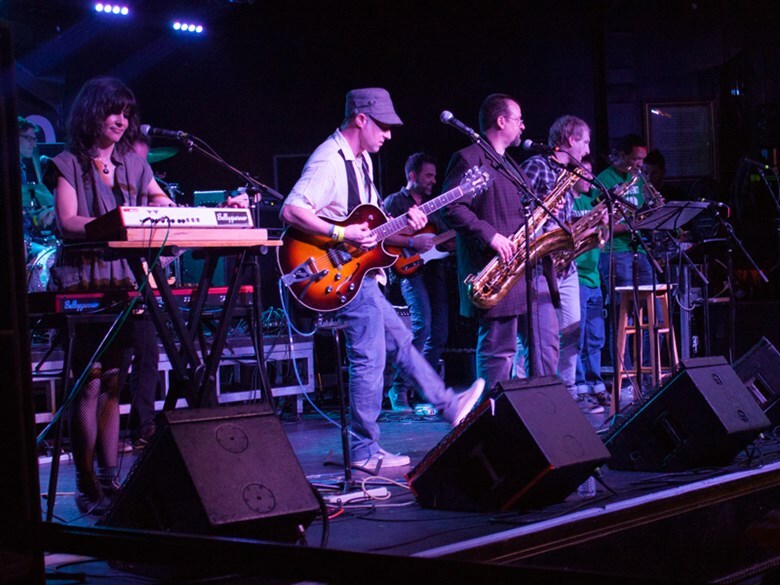 Members of three SAMMIE Nominated bands: Bellygunner, Groovincible, and Element Brass Band teamed up to deliver a 9-piece hybrid band! Read more about the SAMMIES Award show here! The complete Bellygunner set from the Sacramento News & Review Sammies Award Show. Jacob Gleason (Tenor Sax from Groovincible) worked with Christopher Gabriel Nelson to make the horn chart for “Sextoy Sextoy” and it was performed by Chris Hall on Baritone Sax, and Aaron Smith & Justin Au (from Element Brass Band) on Trumpet at Ace of Spades. Official teaser video for the new single Tryin Hard. This video features footage taken by Matt Klee from For the Funk of It 2014, Pus Cavern Recording, Dive Bar and more! Available for FREE DOWNLOAD on bandcamp and soundcloud this saturday, March 14th, 2015. RECORDED ON THURSDAY, MARCH 13TH, 2014 IN SACRAMENTO, CALIFORNIA. Performing with The Bumptet at Lost on Main in Chico, CA! Friday, March 14th , 2014 at Lost on Main in Chico, CA! We are excited for this show, we’ll be getting down with our friends The Bumptet! You can also prepare yourself for the amazing talents of Sam Phelps on Keys & Brian Chris Rogers who will be rocking out on Bass! Bump all night to the funky grooves! Video of ZuhG feat. Groovincible at the 2013 SAMMIES! Performing at The Club Car in Auburn, CA! Friday, December 27th, 2013 at The Club Car in Auburn, CA! Groovincible featuring Brian Chris Rogers & Sam Phelps! Groovincible performing at Harlow’s in Sacramento, CA! 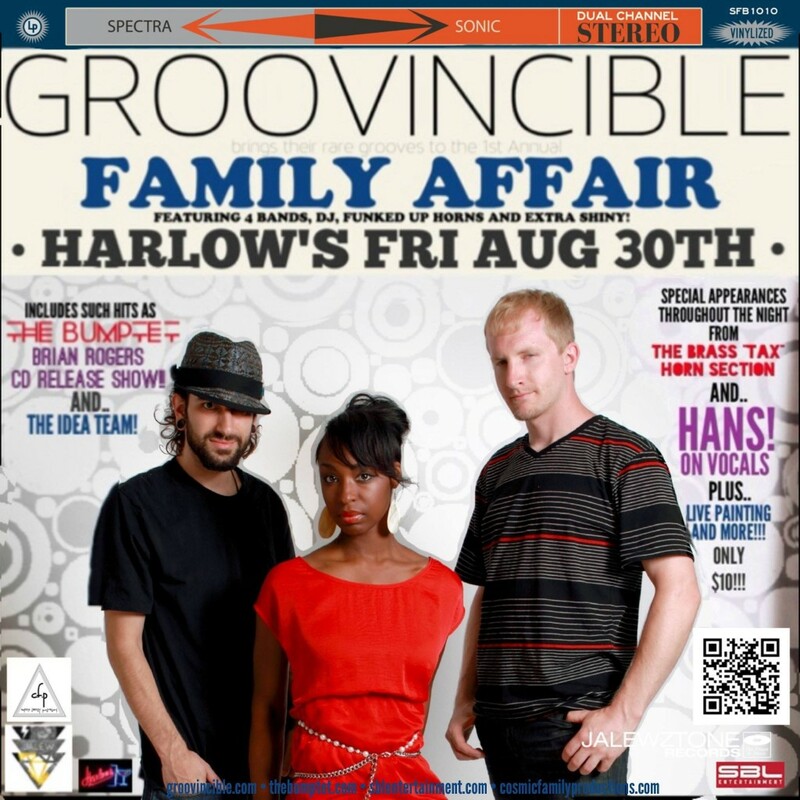 Friday, August 30th, 2013 at Harlow’s in Sacramento, CA! A Labor Day Weekend “Funk and Soul Party” featuring The Bumptet, Brian Chris Rogers CD Release Party w/ Groovincible, and Ideateam. Special vocal appearance by Hans from Joy and Madness. Live art by Jared Konopitski and Jesi Naomi. This night will go down in History! Candid footage of the band members recording in Groovincible Studios. Audio recorded live by Mark Noxx on May 18, 2012. Boom Boom Room Presents Groovincible! Performing at PJ’s Roadhouse with special guest James Pace! Groovincible Wins 2016 Best Funk SAMMIE! Nominated for a 2016 SAMMIE! "Always aim at complete harmony of thought and word and deed."